Delivers next-generation Wi-Fi MU-MIMO technology for high-density performance and maximum data rates up to 2.53 Gbps. Clustering helps to reduce the costs and complexity of managing multiple wireless access points simultaneously simplifying administration and management. Specifications are subject to change without notice. An active, customer-purchased Internet Service Provider broadband account is required for connection of this access point and other connected computers and devices to the Internet. * Maximum performance derived from IEEE Standard 802.11 specifications. Actual performance can vary due to a number of factors including lower wireless network capacity, data throughput rate, range, and coverage. Performance depends on many factors, conditions, and variables, including distance from the access point, volume of network traffic, building materials and construction, operating system used, mix of wireless products used, interference, and other adverse conditions. * The standard transmission rates—1733 Mbps (for 5 GHz), 800 Mbps (for 2.4 GHz), or 2.53 Gbps combined —are the physical data rates. Actual data throughput will be lower and may depend on the mix of wireless products used and external factors. 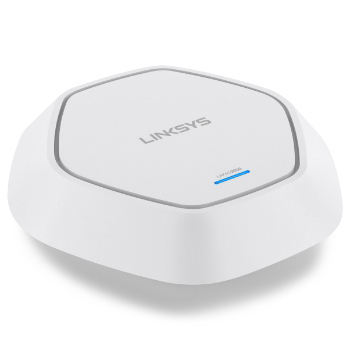 Download the Linksys LAPAC2600 Data Sheet (PDF).